New Southern Commander Maj. General Nathanael Greene determined that he needed time to rehabilitate his army. He decided to split his force and assigned command of the more mobile force to Brig. General Daniel Morgan. British Lt. General Charles Cornwallis recognized the strategy and sent his own mobile force under Lt. Colonel Banastre Tarleton after Morgan. After several weeks of maneuvering, General Morgan finally had to choose his ground before Lt. Colonel Tarleton overran him. He settled on Cowpens, South Carolina. He counted on British expectations of a militia retreat as it had at Camden, so that when Andrew Pickens' militia withdrew as planned, the British became undisciplined and broke ranks. 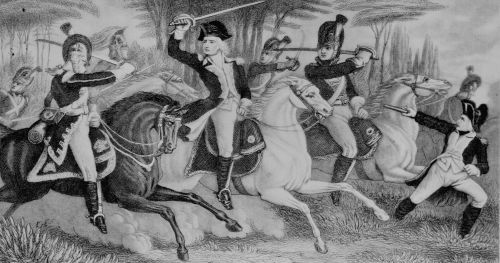 This loss of discipline allowed the ordered actions of the Continentals to thoroughly rout the British and destroy General Cornwallis' light troops. Greene's Arrival - General Nathanael Greene arrives in the South. Generals Greene and Cornwallis maneuver and plan. Lt. Colonel Tarleton pursues General Morgan. General Morgan Arrays His Troops on the Battlefield. Aftermath - Fallout from the battle. Bibliography - Websites and books used as reference.